Australia’s only community justice centre is the Neighbourhood Justice Centre in inner-city Melbourne. Its integrated approach to justice, service co-ordination and crime prevention is one many would like to see tried in NSW. To encourage this discussion Ann Strunks tells us about a project the centre undertook in Smith Street Collingwood. The Neighbourhood Justice Centre (NJC) opened in 2007 and is Australia’s only community justice centre. It is located in the suburb Collingwood and serves the justice needs of residents of the City of Yarra through a range of co-located and co-ordinated justice and social services. Underpinned by principles and practices of therapeutic jurisprudence and restorative justice, we provide new and innovative ways for dealing with crime, social disorder and social conflict. Victorian Civil and Administrative Tribunal residential tenancy matters, guardianship matters and a range of other civil disputes. In keeping with the principles of community justice, our Court has one magistrate who hears all matters. In this way, our Magistrate has a deeper understanding of the wider social conditions that affect criminal behaviour and rehabilitation. Our Client Services Team provides assessment, treatment and referral services to persons referred through the Centre’s justice processes, and Yarra residents who self-refer. In addition, a range of justice and social service agencies work collaboratively to provide integrated, co-ordinated services. Services include mediation, legal advice, employment and housing support, financial support, drug and alcohol counselling, family violence and victim support, and mental health services. Our Crime Prevention Team and Community Engagement Team build partnerships and networks with and across justice-related agencies, social service providers, local businesses and business associations and importantly, the people of Yarra. We are working with the community to reduce criminal and other harmful behaviour, improve the wellbeing of our community, tackle the underlying causes of criminal behaviour and disadvantage, and build the capacity of the community to solve its own problems. Five kilometres north of the heart of Melbourne, at 19.5 square kilometres the City of Yarra is one of Australia’s smaller inner city municipalities. Yarra is home to 83,593 people and 33,500 households. Around 66,792 work here. Approximately 29 per cent of the Yarra’s community was born overseas and there are around 67 languages spoken in the area. The NJC was established to service the City of Yarra a part of the State Government’s A Fairer Victoria policy. Smith Street Dreaming is an Indigenous music festival that celebrates the lives of the people who live and work on one Melbourne’s most iconic streets. It’s also a one-of-a-kind. In 2012, local Elders and members of the Indigenous community started a conversation with local police, business owners, service providers and the Neighbourhood Justice Centre (NJC). Through raw, honest and long-overdue conversations we realised we all wanted the same things: social inclusion, cultural respect and diversity, safety, and community. From talk came music. Smith Street Dreaming honours the rich diversity, culture and spirit of Collingwood, and we reminded each other that we build strong communities by sharing stewardship of all these things. The NJC is very proud to have been at the vanguard of the formation of the Smith Street Working Group that runs this annual event. Our festival is a milestone for how the Working Group is resolving long-standing tensions, tackling the underlying causes of crime, and building safer communities. For the NJC, the Working Group is the milestone for how the community justice achieves these goals by taking the right approach, instead of the ordinary one. This is why this is not an overview of how we are reducing offending rates and building inter-cultural harmony through conflict resolution and alternative dispute methodologies. It is the story of how Justice is doing these things by stepping out of its comfort zone and walking in someone else’s shoes. History is the best vantage point from which to appreciate what the Smith Street Working Group has achieved. Collingwood lies at the heart of the City of Yarra, one of Melbourne’s oldest inner city suburbs. Like our Sydney cousins, Collingwood is a paradoxical mix of rapid transformation and stagnation. High income earners are driving (ware)house prices through the roof even as some of our city’s most vulnerable and disenfranchised live in the towering estates and downtrodden back streets that few outside the area realise exist. The rakish heart of Collingwood is Smith Street. Stylish eateries, bars and shops are rapidly papering over its shabby past, and at once bohemian, chic, edgy, tatty and hip, it’s a street upon which the rich rub shoulders with the poor, and beside excess, addiction, poverty and social exclusion struggle in plain sight. While those suffering the usually cargo of addictions and desperation come in all shades, none are as vulnerable as our local Aboriginal community. Around 320 Aboriginal people live in Yarra, most within a stone’s throw of Smith Street. Collingwood sits on the land of the Wurunderjeri people and Koories are proud of their historical ties and deep social connections to the place, and to this day, Smith Street is an important meeting place for Aboriginal people living or visiting the area. Despite Archie Roache’s insights, when the Neighbourhood Justice Centre (NJC) opened its doors in 2007, there were significant tensions between local Koories, business operators and the police. Views differed as to the causes. Traders had reason to complain that members of the Aboriginal community were acting egregiously, and fearing for the safety of themselves and their customers, they blamed Koories for driving away trade. Police said they wasted time and resources dealing with disorderly and criminal behaviour, much of which stemmed from the local Aboriginal community. Our Aboriginal neighbours justifiably argued they had every right to gather in a public place, and pointed to a history of dispossession, disconnections from family and community, structural exclusion, racism, substance abuse, endemic poverty, and other easily identifiable disasters. As usual, the truth is more complex, elusive, and mercurial. The City of Yarra and Collingwood in particular, has one of the highest crime rates in Victoria. Illicit drug use is a significant issue for Yarra, and drug users come from further afield to buy and sell and attend the variety of social services, including the major public hospitals operating in the area. Collingwood deals with higher rates of drug and alcohol related crime than other local government areas, except for our neighbour, the City of Melbourne. Painfully, members of our local Aboriginal community, in particular the self-named ‘Parkies’, who meet on Smith Street and surrounding streets, are victims of the Stolen Generation, and most suffer from the intergenerational traumas induced by intergenerational racism and flawed ‘solutions’. Little wonder Australia’s shame is still visible on streets across the nation. Despite the fact that drug and alcohol abuse cuts across race lines, the local Aboriginal people, and pointedly, the Parkies, are targeted as the primary cause of anti-social behaviour in Collingwood. The Aboriginal community might well rephrase this to say they have been the primary scapegoats. Equally, while disingenuous to say the long-established businesses have tolerated anti-social behaviour, it’s fair to say new business operators demand ‘something is done’ without understanding the history or historical significance of Collingwood. As this potted history explains, over the years authorities have sought ways to combat the anti-social behaviour and tensions that have made Smith Street notorious. In 2004, local and state governments, social services and Yarra Council formed the Street People’s Committee, and planned a range of services to curb excessive drinking and attendant problems. The committee sought a mobile assistance patrol to get intoxicated persons off the street and into appropriate care – for example, home or hospital. A sobering up clinic would support the patrol, and an Aboriginal cultural centre run by and for Aboriginal people, would complete the triangle. For a host of reasons, these initiatives were not funded. Two years after the NCJ opened its doors, Yarra Council banned alcohol consumption in public areas in the City of Yarra. Council says it introduced Local Law 8 to reduce alcohol-related violence and self-harm, but the NJC understands it was primarily legislated to address traders’ complaints leveled at the Koories of Smith Street. In 2010, a year after its introduction, alcohol and drug centre Turning Point evaluated Local Law 8 and found it was highly detrimental to the Indigenous community. Some in the Aboriginal community relocated to Richmond, a neighboring suburb and a world apart. Richmond grapples with harder drugs, and as one observer told the NJC, what authorities could see happening on Smith Street, hid from view in Richmond’s laneways. As one social service worker told the NJC, the law had one positive outcome: it increased Koorie involvement in Council process as they railed against the racist aspects of the law. Today Local Law 8 rarely is enforced. The local Aboriginal community meets on Smith Street, and students, after-work crowds, and weekend partygoers continue their revelries. On a positive note, in this period, Victoria Police and the Department of Justice created a range of Aboriginal outreach and liaison roles (staffed by Aboriginal Australians), and significantly, the Department of Justice signed the Aboriginal Justice Agreement. Yarra Council initiated its first Aboriginal Partnership Plan 2004-2008, developed an Aboriginal History Walk and other cultural events, and Indigenous council staff made much needed headway. For all this, up until 2012 the fact remained: police were responding to upwards of ten incidents a day in response to traders’ request for assistance. There were ongoing reports from traders about threatening behaviour by some Parkies, and for some traders the crisis was at breaking point. Additionally, the Smith Street Traders Association said that trade was slow and attributed the malaise, in part, to the behaviour of the Parkies. On the other side of the street the Koories, particularly the Parkies, felt besieged, and worse, believed they were being forcibly removed and displaced from their rightful meeting places. Gentrification comes at a cost for everyone. So, why has the NJC’s Smith Street Working Group achieved so much, so quickly? The genesis of Smith Street Working Group is an interesting one, as it is part strategic, part organic. In 2012, NJC Crime Prevention project manager, Hieng Lim, witnessed the arrest of three local Aboriginal people. At the time, he was in a nearby shop talking to shop trader Dianne Harris. Dianne was to become one of the leading champions of the Smith Street Working Group, a huge force behind the festival and a remarkable example of openness and reconciliation. For now, she was at wits end about the anti-social behaviour and shop thefts perpetrated by local Koories on a regularly basis. Lim reported the arrest and the trader’s complaints to NJC management and the local police inspector. Lim said the law responded to a minor infraction with unwarranted heavy-handedness; the response being indicative of entrenched misconceptions and a complex amalgam of animosities. Of the behaviour that lead to the arrest Lim said, while not excusable, it was understandable when viewed through the long lens of cultural alienation. And though we agree the traders’ grievances with local Koories are often justified, we know the tensions are indicative of wider and deeper social issues playing out every day across the nation. Community justice works best when it works flexibly, which is why the path that led to a music festival is a winding one. We foresaw our ability to open dialogue between traders, police and the Aboriginal community, even if we had no plans to formalise relations under the banner of a committee or working group. Our first targets were the ‘low hanging fruit’ — police, social services and local council. However, instead of bringing the authorities to the table en masse, we built relations with individual key players. Over many months we worked with police, community service providers, city council, the traders and Aboriginal Elders. Our softly, softly approach gave each person the breathing space to voice understandable cynicism and suspicion, air grievances, ask candid questions and question the NJC’s legitimacy and capabilities. “In some instances we worked with stakeholders such as the police, on projects they were running. On the opposite end of the scale we met Elders and local Parkies on street corners and park benches,” Lim says. “Over the months we realized we were doing more than brokering dialogue; we were forging alliances that were naturally falling into an organizational framework”. The metamorphosis of hundreds of individual conversations was the Smith Street Working Group. Aboriginal Elders, police, traders, social service providers, Council and the NJC convened the first Smith Street Working Group in late 2012. It took a few more months of ‘footpath meetings’ before Parkies came to the table, but the fact that the most vulnerable people now share stewardship of our neighbourhood is a testament to the tenacity of community justice. The Working Group adopted a mix of informal and formal processes. For the Aboriginal community, the informal is formal, so to this day meetings are “getting together for a yarn”. NJC workers still largely manage formal process such keeping minutes and documenting proceedings. § making Smith Street safe and harmonious for everyone who visits, lives or works on it. Trust is a remarkable teacher. The group quickly decided to: establish a Cultural Awareness leaflet to assist police communicate with Aboriginal people and understand their culture; for Elders, NJC’s Koorie Justice Workers and members of the Working Group to explain Aboriginal culture and communication at police induction days; and produce an identity kit to assist police identify Aboriginal outreach workers when out on foot patrol. These ideas are in progress. A music festival took precedence. That the newly formed collective of Elders, Parkies, traders, police and justice-related agencies willingly met once a month (and daily towards curtain call) to deliver a successful Indigenous music festival took everyone by surprise. It hasn’t been an easy road. There have been many challenges establishing and maintaining the Working Group. The first meeting was very confrontational and in the early days the “poor relationship” between the key stakeholders (the police, the Aboriginal community and the shop traders) was a major hurdle. Smith Street Dreaming 2013 happened because a complex web of coincidences and relationships converged, and the zeitgeist was right. 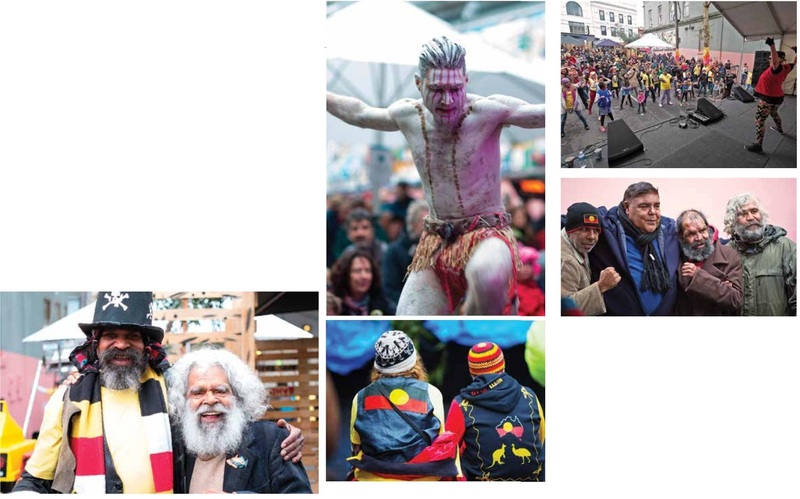 The festival was the manifestation of respect for the local Aboriginal people, giving them the opportunity to celebrate their identity and connection to place. It also gave the justice system —specifically the NJC — a place to have low-risk conversations with a wide range of groups to generate respect and a shared sense of civic pride and stewardship. (About 500 people came to the first festival. The Working Group decided to use minimal promotion as we wanted a good crowd, not an overwhelming one). In 2014, more than 1,200 people from all walks of life enjoyed musicians Joe Geia, Deline Briscoe, Crystal Mercy, Bart Willoughby and Nikki Ashby. Uncle Jack Charles was Master of Ceremonies. Since the establishment of the Smith Street Working Group, police call outs to Smith Street have fallen from around 10 per day to between 6 and ten a month. Crime in the Smith Street has also dropped by about 33% over the last two years. These statistics are testament to what happens when the justice system sees the world through other’s eyes and listens to someone else’s stories. The 2014 Smith Street Dreaming won the City of Yarra’s Community Event of The Year. We’ll keep you posted about this year’s festival because it promises to be a dream come true. “The Smith Street Dreaming was a unique and moving experience. As a councillor whose ward takes in Smith Street, and a member of Yarra’s Aboriginal Advisory Working Group, I have been keen to see a way to integrate all the social and cultural elements which make up Smith Street’s identity. Smith Street Dreaming did just that. Councillor Amanda Stone, City of Yarra. Peter Beckers is Senior Sergeant at Collingwood Police Station. He came to Collingwood in May 2011 and got to know the locals and the issues. He met Hieng Lim and Di Harris at a public meeting and joined with them to start the Smith Street Working Group. He says the broad representation on the Working Group with people from diverse services and diverse cultural backgrounds means it’s a rich tapestry. “The impact of the festival has been amazing. Things have quietened down around Stanley and Moore Streets. It’s had a ripple effect. There’s real community engagement now. Police are seen as more human and my officers get out there and talk now to the Aboriginals instead of just directing them. They make conversation with them. There’s an attitude now from everyone of, let’s embrace the Aboriginal peoples’ knowledge and expertise and let’s reap the rewards.